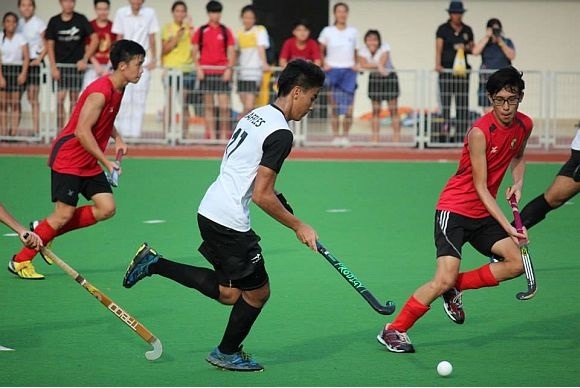 The last time RI Hockey managed to secure both places in double finals was nearly a decade ago, whereas a double gold had not been attained for over 15 years. 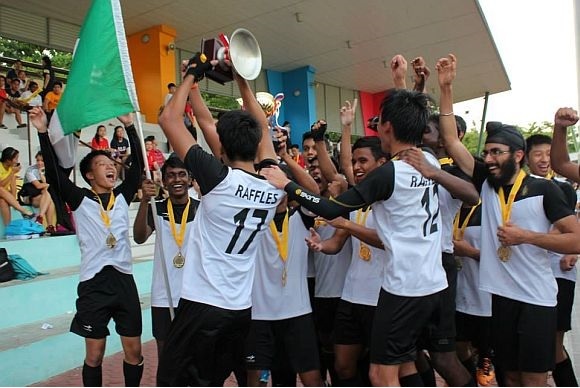 Considering the past six to seven seasons of near-misses, dubious decisions and arduous preparations, victory tasted especially sweet for the Year 6 boys of Raffles Institution (RI) Hockey, who emerged undefeated from this year’s Inter-school National A Division Championships. Bowling over Anglo-Chinese Junior College (ACJC), the imposing score line of 6-0 at the end of 60 minutes was a true reflection of the sheer calibre, discipline and perseverance exemplified by the team as a whole. Standing strong: RI poised to take a short corner. 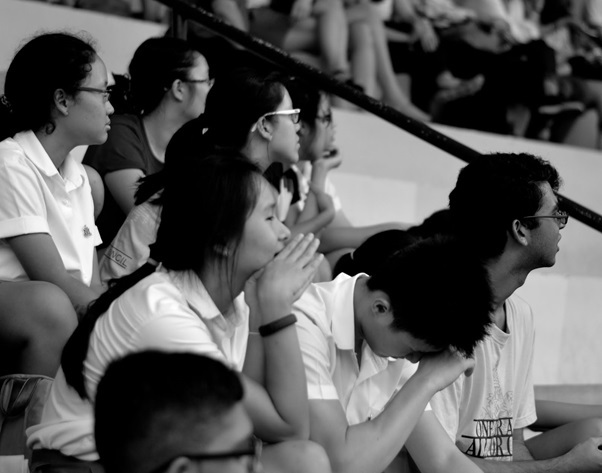 Having just ousted the reigning Victoria Junior College, ACJC, whom Raffles previously faced off with in the preliminary round, seemed more inclined to pose a larger threat at such a level of competition. Determined to seize the title after a narrow defeat via penalties last year, morale ran high amongst the players who were “motivated and pumped up” to exhibit the best of their abilities. 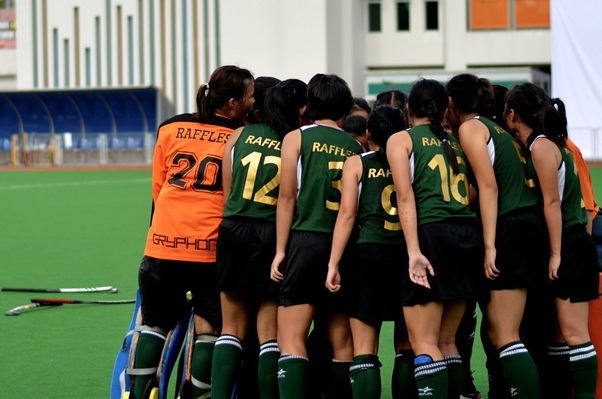 Rishi’s resilience: A rock in safeguarding the Raffles goal. Keeping to a predetermined structure that minimised unnecessary passes, a focused RI side enjoyed comfortable possession of the ball, allowing for early breaks into the D courtesy of left back, Harshvir Singh. 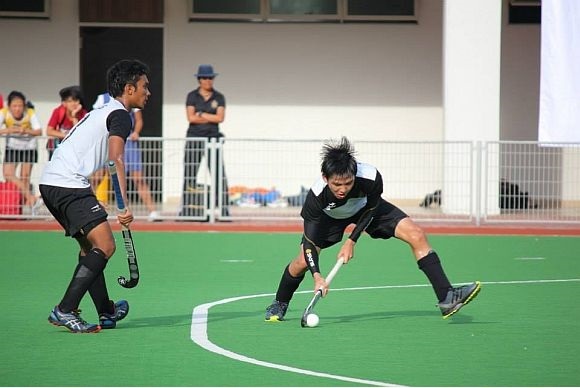 Paired alongside the dominating presence of vice-captain Rishi Ramathas who held his own against sudden counter-attacks, Benjamin Ang was a relentless force that did not balk to hinder any hint of opposition. Maintaining fluid control of the ball in check, a tight defence swiftly converted into an aggressive assault spearheaded by captain Ahmad Ashraf who drew first blood with a resounding shot through the keeper’s legs. In response, ACJC’s Gerald Goh swung in a precarious lone strike outside the shooting arc that was disallowed much to the obvious relief of the supporters present. Reeling from such a brash attempt at goal, Raffles redoubled their efforts in their monopoly of midfield with central midfielder Muhammad Ramzi deftly setting up Mohamed Haseef who dribbled along the baseline and coaxed another one in. Proclaiming the match to be the team’s “best performance” this season, Ashraf’s fervour in slotting in an optimum number of goals shone through with a formidable dive which deflected the ball straight into the net. 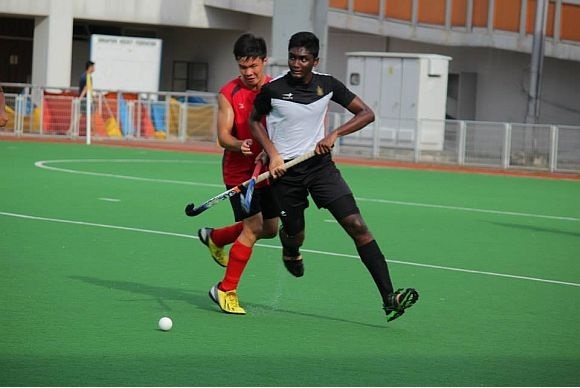 Even the slightest falter in defence was optimised; at one point, ACJC’s Gerald went head-to-head with RI goalkeeper, Ram Kumar who stepped up and instinctively kicked the ball out of harm’s way. Truly, the team persisted in asserting their well-earned dominance of the game even throughout the second half when ACJC made a more concerted effort to regain their footing. Nevertheless, Anglo-Chinese’s close-knit passing did not achieve the equilibrium they aspired for, only to incite a fervent Rafflesian offensive that drilled home their advantage. Easily intercepting and bursting through the opponents’ ranks, it was Ramzi’s confident ball play and Haseef’s precise cross that assisted left winger Gurveer Singh in putting another one past the keeper. 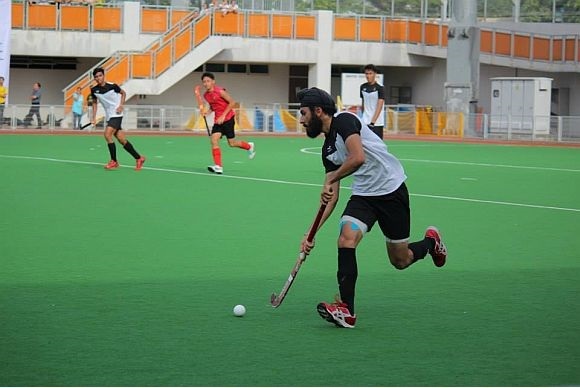 Instead of yielding their momentum, the goal finding frenzy intensified by a twofold – via a rebound shot by Ashraf and the combined effort of forwards Yeung Jek and Anirudh Srivathsan in the last few minutes of the game. Later attributing RI’s success with their tenacious adherence “to the game plan”, the sense of pride and camaraderie for his team was palpable as Ashraf commented, “The feeling [of victory] is indescribable. After so long, we finally did it!” In the face of two reckless green cards and crowd-wowing, mid-air-ball-stopping skills, we could not help but share the giddy sentiment. 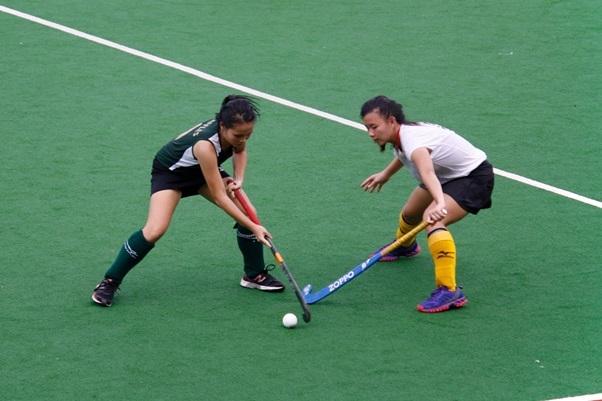 The beginning of the girls’ game was highly contested, with RI edging a slight positioning lead over the VJC team with regards to ball control, but both teams’ solid defences initially prevented any team to gain a written advantage through an open goal. However, a clean penalty corner led to VJC scoring the first goal of the match, but the advantage that VJC was hoping for soon disappeared after a clean penalty corner with a smooth pass through VJC’s defence equalised the score in favour of RI. The game reached half-time with an equal score of 1-1. The second half of the game started with a quick succession of VJC penalty corners, forcing RI’s strong defence pressure to weaken and eventually concede goals. VJC also managed to take advantage of RI’s tight defensive structure, issuing passes which managed to allow them to take possession of the ball despite constant pressure. Both teams were able to effectively deliver pressure to the opposing team, leading to a drought of open goals in the game. This was true both offensively and defensively, where defenders were quick to respond and goalkeeping from both sides was extremely solid. However, VJC was slightly more comfortable with gaining penalty corners, where defensive numerical pressures were severely reduced, which contributed to their lead over RI. 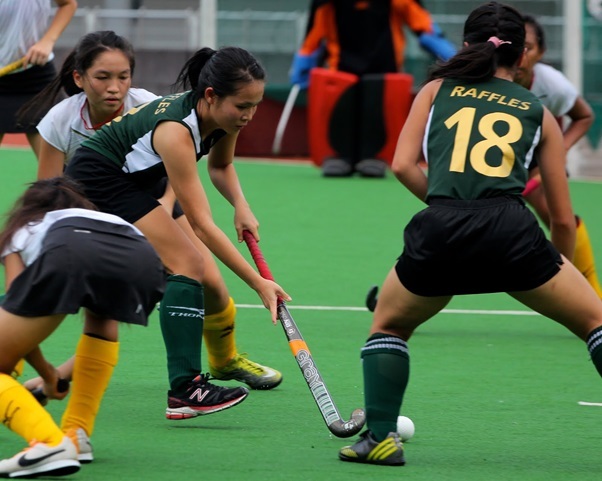 By the end of the game, all of VJC’s goals had come from penalty corners, signifying their importance in the fiercely-contested finals of which VJC had eleven penalty corners – a large margin over RI’s two. Penalty corners were especially important in this game due to what it seems to be both teams eschewing unpredictable long-range passes for more accurate short-range passes. Additionally, VJC’s slight advantage in mobility in terms of responsiveness to unpossessed balls and interceptions led them to take the advantage in an otherwise equal game of skill. Unfortunately, the game was scarred with a double injury from the RI side, a rarity to most hockey games. During the second half of the game, RI’s Rebecca Kang received a direct impact from the ball to above her right eye, collapsing immediately and had to be taken off the field. 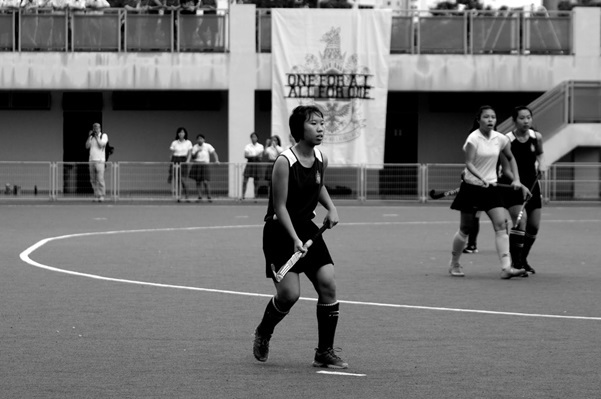 Following soon after was RI’s Beverly Goh, who received a severe debilitating cramp which led to her unable to continue playing. Despite two consecutive injuries, any dampening effect on moral was hardly noticeable in the field; RI’s team continued to play as hard as they had before.